It’s one thing knowing how to approach a woman in a club, or at a party, where approaching women is to be anticipated. But beautiful women do not simply visit places of leisure, and you may find yourself in an everyday situation wondering how to talk to a girl you don’t know in a context you don’t expect. Such a context is the supermarket – a veritable hive of off-duty professional women, groups of university students, hot cashiers looking for a distraction from the beeps and whirs of the till point and single mums. Sometimes you’ll want to pick up more than a pint of milk and a scratchcard. 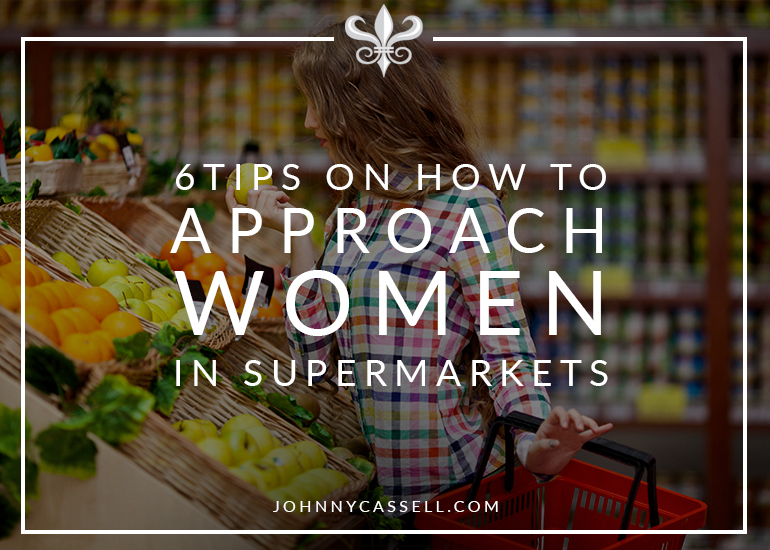 Here’s the rundown on how to approach a girl you like in the supermarket. Timing is always of the essence when thinking about how to approach girls, but shopping is a journey from one side of the shop to the other. That sounds obvious, but I recommend avoiding the end of their shopping trip as if you don’t normally know how to approach a girl and close quickly you are not leaving yourself a great deal of time to lay a solid foundation for an approach. Likewise, be sensitive to the aisle you’re both in. I find the fruit and vegetable aisle a really strong threshold to start – there’s a lot of choices, a lot of questions you can ask and a lot of jokes that can be made to kick things off. This aisle also tends to be near the entrance to the shop so it gives you a little while to relax into conversation and build a profile of the girl. Reacting to a woman’s personality and aspects of her life is the best way to approach a girl. A key message from my 7 Day Course is that there is no need to be conventionally good-looking to succeed in how to approach girls so long as your confidence and sense of purpose shine through. However, part of showing that confidence is presenting yourself.. Keep yourself groomed, wearing clothes that suit you and hair that doesn’t attack everyone around it. This will help you feel confident and look the part wherever you make your approach. A woman is only going to respond to confident, relaxed approach that makes her feel at ease around you. Looking like the best you will only bolster this. Shopping habits and purchases, unsurprisingly, say a lot about who we are and what we like. Conveniently, this is exactly the type of information that helps when lining up how to approach a girl you don’t know. Is she buying vegan produce? A particularly interesting ethnicity of food? Especially spicy meals? Outlandish exotic vegetables? Wine? Even something particularly indulgent like cakes or treats? Maybe pick the same thing from the shelf and look over quizzically to engage in conversation. Or, try to choose between two odd vegetables to go with a particular meal and ask for her feedback (‘You seem particularly well-verse in the art of the vegetable, my stir-fry is missing something. Any recommendations?”) If you’re particularly funny, make a well-targeted joke about a product she may have in her basket. Also take the opportunity to match up your lifestyles – check for a ring and any baby products as a sign that the approach may be tricky or she may not be up for taking the encounter any further. That shouldn’t ever prevent you from starting up a fun conversation. Because nobody is going to talk to a fart. Supermarket pick-ups are a split-second, impulsive art. Hang around the same aisle as her for too long, the guard goes up. Follow her around like a lost puppy, the guard goes down, in spite of how endearing puppies can be. Make your approach shy, and hesitant, and forced, the guard goes up. Nervous body language will have a similar impact. Remember that a confident approach can succeed regardless of where you are, and a supermarket can give you far fewer ‘social blockers’ to your approach – she will generally be alone and not on a phone or with a large group of friends – but it is not where women are going to be hit on as a priority. Anything less than your peak confidence will create barriers. 5) WHAT IF SHE’S AN EMPLOYEE? In some instances, the girl you’re checking out is the one checking out your sardines and your snacks. And, if she’s an efficient cashier, you won’t have that long to make an impact. Make eye contact, smile and ask for her name. Maybe fire off a question or two about if she enjoys working there. See when she gets off of her shift and ask for her number. Taking too long will tank the experience as she may very well be stressed from a hard day, or conscious of any long lines forming as you sweat out an intricate play. Keep it simple, direct and confident. 6) THIS IS JUST ONE APPROACH OF MANY. The key to pulling off this scenario is no different to the key of any other. My course teaches that if you have the foundation of confidence, good reactions to your surroundings and an easy manner you should see successes in spite of unusual or mundane contexts. That’s not only how to make an effective approach, but also how to get women to approach you. To take the next steps on your path to complete confidence, you can check out my courses HERE. Happy shopping!